The past few days have been hectic. Thursday morning I learned that Tom died. On Friday Elise and I went to my parents’ house. Our mission was to work cows Saturday morning. We woke up to cold rain and had to give the cows a raincheck. We’ll have to go back another time to help my parents. We left Mom & Dad’s Saturday evening to go to Adrian‘s graduation party (he recently earned his Master’s Degree). Adrian came up with a couple good games for all of is to play and it was really nice to meet some of Adrian’s family and friends. We left Bellville close to 10 p.m. and headed back to Austin in rain. We got back to Austin around midnight. I stayed up until 2 a.m. getting stuff ready for Jack’s baptism later that morning. Elise stayed up until closer to 4. The alarm sounded too early. We both got out of bed and started to load everything to take to John’s aunt and uncle’s house. Sunday morning was hectic. To spare the details, we made it to church on time for Sunday service and Jack’s baptism. Elise and I are officially Godparents. The reception went well, we were exhausted and still are exhausted. We both fell asleep around 8:30 last night. Elise is funny and Demi is hot. A friend of mine died early this morning. I don’t want to think about it now. I was very inspired to think and write shortly after I cried on the way home from work, but not now. I’m upset right now because I should have called him… A friend that I hadn’t seen in years and had just thought of this past weekend. I had so many questions for him – and so many more now that he’s gone. With quivering knees I stood in the garage this evening and listened to tapes we had made together ten years ago. Just like he and I did ten years ago. I moved Janicek.com from Blogger to WordPress 1.x earlier this month because 1) I wanted my publishing software to be on my server versus Blogger’s server and 2) because I really liked the clean design of Michael Heilemann’s Kubrick template for WordPress. I personally like having random photos that we’ve taken or are meaningful to us for our website’s mast. Download Kubrick 1.2.6 and unzip. Open ‘Kubrick Theme.psd’ in Photoshop (I’ve done these steps using Photoshop 5.5 & 7 in Windows and Photoshop CS on my iBook). You only want to concern yourself with the ‘Blue Header’ layer (should be the fourth layer from the top). Highlight the ‘Blue Header’ layer and select it with the Magic Wand Tool. Open the photo(s) you want to use for your header. Note: your header image is going to be 720 x 182 pixels, your photo should be at least that. Paste the copied ‘Blue Header’ layer onto your photo and change the opacity of your Blue Header to 50% so you can see your image in the background and position Blue Header to your liking. Once you have your Blue Header positioned, change the opacity back to 100%. Use the Magic Wand Tool to select the Blue Header layer. Now highlight the background layer in your layers palette. Copy (Ctrl+C, Command+C or Edit > Copy) the background selection. Open ‘kubrickheader.jpg’ (Kubrick v1.2.6/images) in Photoshop. Paste your selection onto ‘kubrickheader.jpg’ and position accordingly. Congratulations. You have a custom header. Upload all of your header images (see steps above) to your rotator folder. Rotator.php and your header images must be in the same folder. For WordPress 1.5 login to your WordPress installation. Presentation > Theme Editor and click Header Template on the right. I was offered a job at Scott & White two years ago today. I worked there for ten months. I was miserable nine of those ten months. Whew. BIG whew. I’m convinced that we (Elise, Riley, Annie and yours truly) live among at least one spiritual being. Last Spring I was moving things around in the attic and felt a strong presence. I was scared, not bone-chilling scared – but I knew something was with me. Recently I was home alone. It was nearing dusk and I was walking from my office into the kitchen. I saw an animated shadow on the floor in the hallway that leads into the guest bedroom. I know it wasn’t a shadow being cast from a tree limb. I walked into the guest bedroom and got that slightly scared feeling again. The the notion of the afterlife and apparitions have never scared me. I attribute this to the fact that, to my best recollection, I’ve never experienced anything supernature. So far I’m convinced that we’re not cohabitants in a house with malicious entities. Nothing has been moved. I’ve found no x’s burned into my shirts. We’re just living among others. Elise indulges me in my theory although she hasn’t independently experienced anything ‘odd’ in this house. I’ve embraced this ghost. I don’t want to be afraid. If we live among something(s) else, I want them to be content. I don’t want to be a burden nor do I want them to burden us. I’m fine with coexisting. Tonight we were startled. Elise and I were sitting on the couch talking. I heard a ‘thump thump thump’. I’m the one who has keen eyes and ears to the paranormal. I immediately said “DID YOU HEAR THAT?!?! ?” Elise didn’t hear it. It happened again. Thump thump thump. Elise heard it that time. It wasn’t from within the house. I wasn’t scared. I was in the ‘told-ya-so’ mode. I was ready to prove to Elise that we weren’t alone. Elise stood up and called for Riley. Riley is the one who will mysteriously lock himself in a cabinet or the pantry and make thumping noises trying to get out. When I came home from work, I let Riley outside. Elise came home later than I did. She didn’t let Riley in. I knew he was still outside. It sounded like the noise was coming from the attic. Thump thump thump. “Let me out”, perhaps. Elise got up again and walked into the kitchen. “Riley?! ?” she called. “Riley’s outside, babe” I told her. I’m convinced that something in the attic wants to be let in. Something wants to “greet” us. Riley has been outside. He’s been jumping onto the patio table to look inside the kitchen window. When he jumps off of the table to walk to the back door, the table wobbles and hits the side of the house. Three times. Okay. It was the cat. But I still think we’re not alone. I decided to cook an awesome chili on Saturday. Elise was working so I ran to Blockbuster to rent Saw. We stayed up late watch watching the movie and had to wake up early on Sunday to meet John & Christine at church. We met Pastor John and introduced ourselves as Jack‘s soon-to-be Godparents. The girls left church and did girl things. John and I went back to John & Christine’s house, put Jack to sleep, watched a couple movies, scratched and grunted. Elise and Christine came home, John and Christine left for dinner with relatives and Elise and I went home and talked about work (which I hate doing on a weekend). I’m in the process of cooking a venison chili. I took the recipe from Hudson’s and made it my own. Chop bacon and render fat in a large pot. Reserve cooked bacon. Brown venison in small quantities in bacon drippings (crank your stove up to afterburner – you don’t want grey meat). Set browned venison aside. Remove 3/4 juice. Sautee garlic, Poblano, celery, onion and cooked bacon. Add stock/Ancho/Chipotle puree. Add bay leaf, lime, brown sugar, cinnamon, chili powder & cumin. Bring to a boil then down to a simmer. Add browned meat and let it hang out for a few hours uncovered. Add beer as chili becomes thick. Today was a great day at work. I finally implemented the custom developed printer software that Systems of Merritt created for us. Lacee was happy because this software has cut her workload in half. Since Kevin has been in St. Maarten, I’ve been hellbent on keeping operations flowing and getting backburner jobs off of my plate. I want him to come back and be completely happy with the way things have been run. Number one on my hit parade was the custom printer software. OnRamp has been doing a fantastic job with redevoping our client websites. Anyway – today was a great day at work… so great that I’m actually looking forward to Monday to see what else I can hammer out! Elise and I had a fantastic dinner at Musashino last night with my former boss, Chic. We started out with a Spicy Spider Roll: Deep-fried soft shell crab, smelt caviar, and radish sprouts and also the Ozzy II Roll: Unagi, yellowtail, and avocado with sesame seeds and smelt caviar on the outside. The sauce that accompanied the Spicy Spider Roll was amazing. I had unfortunately singed my taste buds with a glass of J&B so I couldn’t quite tell what was in said sauce, but believe me, it was awesome. Elise and Chic each ordered a Negihama: Yellowtail and scallions hand roll. We also ordered 5 or 6 a la carte pieces of sushi. I don’t remember all that was ordered but I do remember two of which were a special for the evening: a fatty tuna topped with a sliced Asian chili that can pack just as much a punch as a habanero. I ordered a Sushi Deluxe Jo Nigiri: 7 pieces of sushi and 2 pieces of a futo maki, all of the chef’s choosing. I know I had a peice of Hamachi, fresh water Unagi and an obscure Hawaiian fish. Everything was awesome – The best sushi I’ve ever eaten. Catching up with Chic was also a treat. We had a really wonderful evening catching up. 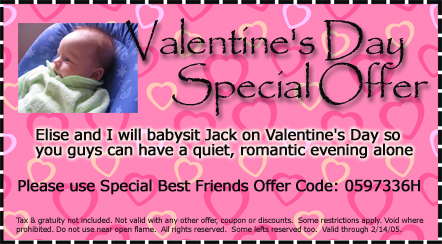 Elise and I spent Valentine’s Day alone – with Jack. We let John and Christine have a few hours off to go see a movie while we stayed at their house and watched Jack. Elise played with Jack while I cooked. I am finally comfortable with my own Pasta Arrabiatta recipe (a la Romeo’s) by mistake. Elise called me at work yesterday afternoon and asked what she needed to buy for dinner. I gave her my list. She forgot crushed red pepper. John and Christine didn’t have crushed red pepper but they did have cayenne pepper. I improvised and the pasta came out better than that at Romeo’s (in Elise’s and my opinion). We watched Fear Factor and played with the (soon-to-be Godson). Elise did most of the ‘work’ but it didn’t seem to bother her at all. I fed the little feller but Elise did all the singing and rocking and holding and cooing and diaper changing. I was exhausted just watching her. If I were to witness what John and Christine go through daily, I’d probably be in a coma. In other news: The week has been hellacious thus far at work. My boss is in St. Maarten all month. I have irons in the fire, fires to put out, fire in the hole and coversheets for the new TPS reports. I spent 5 hours working on one printer today. Elise’s busy season at work is starting up. She worked 16 hours today. She’s came home limping from being on her feet all day. I think she’s conked out on the bed. She came home, limped around, started the washing maching and I haven’t heard a peep since. Tomorrow I have to get up and buy a laptop for work then go to work and deal with more fire. I’m supposed to have sushi with my ex-boss from Vidbook. I’m looking forward to that. After getting raped by the gubmint on Saturday, we had a late lunch at Baja Fresh. We went home and both sulked while retreating to TV/computer distractions. The evening came soon and we decided to rent The Grudge – bad movie – don’t rent it. I woke up early today and decided to go to work. I accomplished a lot. Enough to where a huge weight has been lifted off of my chest. Unfortunately I picked the wrong Sunday to spend all day at work. The weather was gorgeous today. After a whole week of cold, wet weather, the sun came out this morning and rendered two distant clouds and near-80 degree weather. It was so beautiful outside today. And to think: almost one year ago to-the-day it was snowing in Austin! Tomorrow is Valentine’s day – the day where we’re supposed to be hyper-consumers. Last year Elise and her girlfriends had a slumber party the night before V-day. I picked Elise up late on V-day and we had a romantic drive-thru dinner at Jack in the Box. Tomorrow we’re babysitting Jack so John and Christine can have a little time alone and so we can exerience spontaneous liquid poo.